For the grand finale of Family Time, we celebrated my mother’s birthday with some Jewish soul food at Sammy’s Roumanian Steakhouse on the lower east side of Manhattan. My mother grew up eating the kind of food they serve at Sammy’s, and it’s no wonder that she, I, my sister, our kids and most Jews of Eastern European descent suffer from high cholesterol and chronic heartburn. The primary ingredient in almost everything is schmaltz (rendered chicken fat), which was used for cooking by Ashkenazi Jews in Eastern Europe because butter was not kosher and olive, peanut and sesame oils were unavailable. If you don’t get enough schmaltz in the cooked food, there is a pitcher of it on the table so you can smear it on your rye bread as you peruse the menu searching for your preferred means of self-destruction. Appetizer choices at Sammy’s included chopped liver with fried onions, schmaltz and gribenes (crispy fried chicken skin), chopped eggs with onions, broiled chicken livers with fried onions and karnatzlack, a Roumanian sausage made from ground beef, veal and garlic. Then, of course, there was chicken soup with kreplach (meat-filled dumplings). Main course specials included flanken with mushroom barley gravy, calves liver with fried onions, Roumanian tenderloin steak, stuffed cabbage and chicken fricassee, with sides of potato latkes (pancakes), with apple sauce, mashed potatoes with schmaltz and fried onions, kishka, and kasha varnishkes (buckwheat and farfalle). This was all topped off with rugelach and egg creams. The meal was accompanied by live Jewish music and an entertaining waiter who dished out the insults and schmaltz in equal measure, resulting in a festive evening that brought my mother back to her days growing up in a Jewish immigrant household in Brooklyn. For the rest of us, we just thanked our lucky stars that her family got out of Eastern Europe and we only have to eat this stuff on special occasions. This entry was posted in Food, Travel and tagged Chicken, Chopped liver, Eastern Europe, Food, Jews, Lower East Side, New York, Travel, United States. Bookmark the permalink. It was certainly a nostalgic evening. We will do it again for my 100th B-Day! If I live that long!! But I loved the experience—-and especially being with the family!! 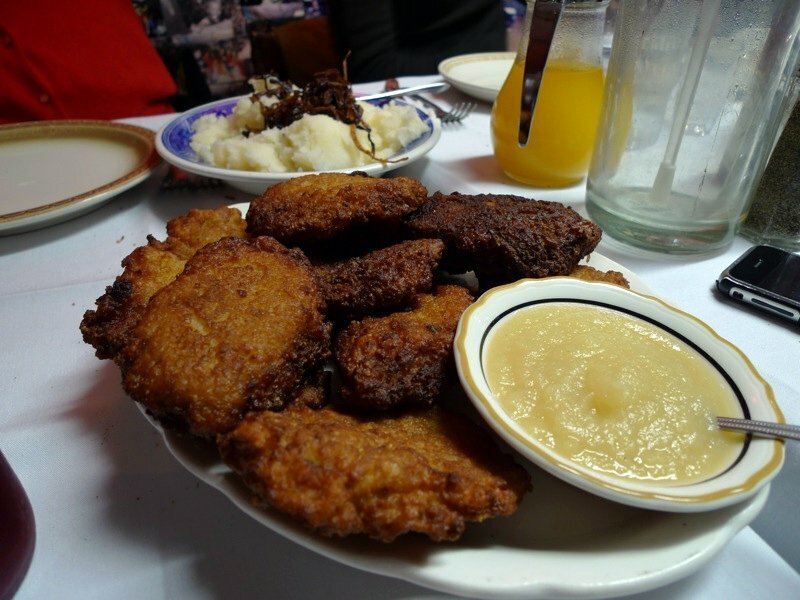 yummmmm…crispy fried chicken skin….broiled chicken livers–when can we go back?